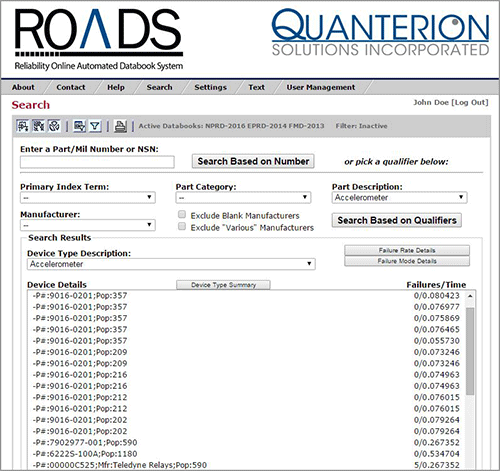 The ROADS databooks will be updated periodically (as new data warrants) and configuration controlled, so that the presented data is always traceable to a specific version of a hardcopy databook. Upon purchase you will be automatically provided with login information to the ROADS system. Try ROADS for free by clicking the button below. The subscription plan you choose will automatically renew thereafter and you will be charged according to your chosen payment method at then-current rates. To cancel you must call us at (877) 808-0097 (Toll Free), or (315) 732-0097 prior to the renewal date. Your Subscription will automatically renew under this Agreement. Your Subscription will continue for the length of the initial term you select on your plan and at the end of your prepaid Subscription, it will automatically renew for additional prepaid periods of the same length unless you choose to cancel prior to that renewal date. In order to cancel your subscription you must call us at (877) 808-0097 (Toll Free), or (315) 732-0097. Your credit card account will automatically be charged (or you will be billed, as applicable) at the rates in effect at the time of renewal. IF YOU DO NOT ACCEPT THESE TERMS, PLEASE NOTIFY US IMMEDIATELY AND WE WILL CANCEL YOUR SUBSCRIPTION. IF YOU DO NOT CANCEL YOUR SUBSCRIPTION WITHIN THREE BUSINESS DAYS OF THE START OF YOUR PLAN, IT WILL MEAN THAT YOU AGREE TO THIS AGREEMENT WHICH WILL BE LEGALLY BINDING ON YOU. This interactive online tool provides efficient search and retrieval of all information contained in the EPRD, NPRD, and FMD hard copy databooks. Containing a built-in search engine, information may be searched on part number, part types, manufacturer, and National Stock Number (NSN). Additional filters are available to specify application environment and quality levels. *NOTE: Contact Quanterion at (877) 808-0097 (Toll Free), or (315) 732-0097 for multi quantity discounts. *NOTE: If you are a 3rd party software tool developer and would like to inquire about incorporating this data into your product please contact Quanterion at the number above.